Often when I go out, I carry not just my handbag but a calico bag with what I consider "essentials" for being away from home. It contains all the medication I am likely to need for the time I plan to be out, but for the rest of the day as well, just in case I stay out longer than planned. It also has my "emergency" drug meloxicam - an NSAID (non-steroidal anti-inflammatory drug) for use when pain is totally out of control. There's also a tube of Voltaren (anti-inflammatory) gel to go straight on to sore joints. Sunblock is an absolute necessity, and I go nowhere without it. There's also hand cleaning gel (I'm obsessive, but I have good reason to be), and in winter a hand moisturiser. Tissues are fairly standard for most people. There's a paper diary which has the basics of my medical history in it, with contacts for family members and doctors, and details of all my medications. (I have the same information in my mobile phone, but phones can break, crash, eat data.) I also tuck blood test orders, doctor's referrals, etc in the back of the diary, so it's always in the bag when I go to appointments. I don't have to think about where I left important pieces of paper. Since my birthday, my gorgeous new Kindle the kids gave me goes everywhere as well. Even if I only go out to buy fruit and veges, there's a chance I'm going to want to sit quietly somewhere and recover before I drive home - and the Kindle is much neater and lighter than many of the paper books I used to carry. Depending where I'm going, a bottle of water, a couple of reusable supermarket bags or a reusable coffee cup, or a piece of fruit, will be added, but those are the basics. 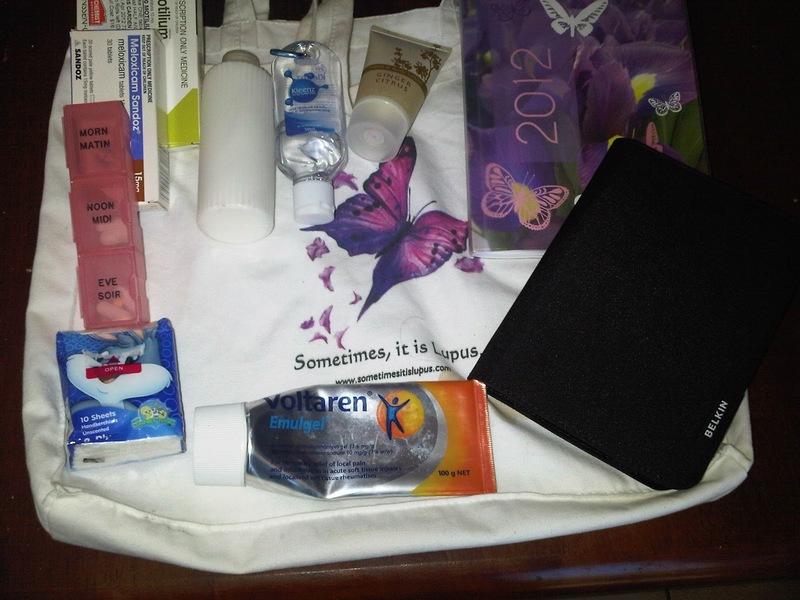 The bag is usually left mostly packed, with just the pills and extras to be added before I go out the door. What an organization ! I like it : every time ready to go.